A colony of light bulb tunicates sit attached to the bottom off San Miguel Island in California. This week's photo is of a species of animal, that's right, what you're looking at is an animal, known as a tunicate. Found exclusively in ocean habitats, tunicates are filter-feeding organisms with sac-like bodies, as can be seen in the photo. Many tunicates are sessile - they are permanently attached to an appropriate hard surface for their entire lives. They take in water from which they remove oxygen for respiration and food through one of the two openings at the top of their body, and expel it through the other opening. This particular species is known as the light bulb tunicate (Clavelina huntsmani) because the light colored structures running from the base to the top somewhat resemble the filament in an incandescent light bulb. This species ranges from British Columbia to Punta Banda in Baja California. Tunicates seem to have evolved in the early Cambrian period some 540 million years ago. 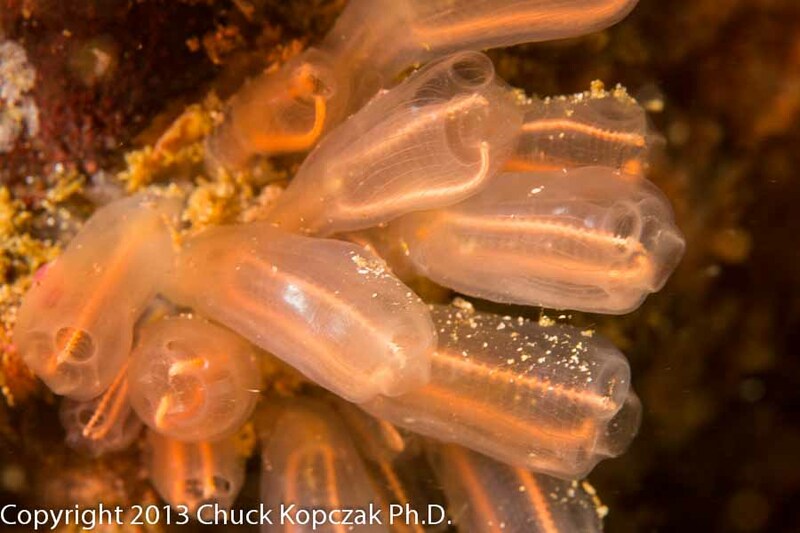 In spite of this early appearance in the history of life, tunicates as a group are very closely related to species with backbones , like humans. While it is hard to believe that something that looks like a hollow sack is a close relative to us, the facts are indisputable. This photo was taken with a Canon 5D MkIII dSLR with an EF 100 mm macro lens in an Ikelite underwater housing. Exposure was a shutter speed of 1/60 sec at f/11 and ISO 100. Lighting was provided by twin Ikelite DS161 strobes set to eTTL mode.